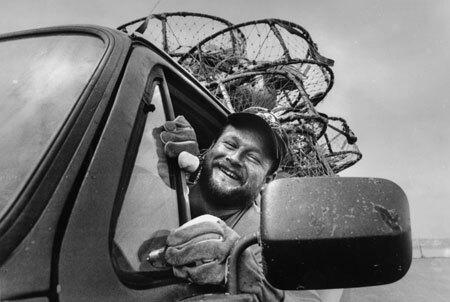 Kevin Haines was beaming as he drove his pickup loaded with crab pots down Drayton Harbor Road. He was on his way to the dock and his boat, The Fishing Vessel Sea Spray. His plans are to go out October 1st for the 8:00AM opening of the official 2004 Fall season. This English, Irish and Italian fisherman came to the Peace Arch City while working on an Alaskan purse seiner that harbored here overnight twenty two years ago. Kevin stayed behind and has been here ever since. He is a fisherman at heart and at sixteen was already a diver's tender on a gooey duck boat. As in the case of many longtime fishermen, Kevin naturally understands how best to get what he wants in his life and how to get the most out of his extended energies. While proudly standing next to his recently mended crab pots he said, "everyone ought to get a fair shake and be given an equal opportunity in life." I was reminded how important it is to first believe and then perpetuate principles that can be understood by everyone and practiced by everyone at the same time. It made a lot of sense when this Peace Arch City fisherman said, "life is simple...it's how you treat people."